Did you hear about the privately-owned, number two home-grown carrier in a country on the Mediterranean among Europe’s top five for airline seats? The loss-making airline has origins in connecting islands to mainland cities and a market share of around 5% of seats in its country. This puts it a long way behind the top two players, Ryanair and the loss-making national ‘flag carrier’ group, and third-placed easyJet. No, this is not a re-run of our recent report on Italy’s Meridiana, but the similarities with Spain’s Air Europa are striking. There are differences, too. Although both of their ‘flag carrier’ group competitors are loss-making, Air Europa faces a more formidable national competitor in IAG than Meridiana confronts in Alitalia, but its SkyTeam membership may partly offset this. Moreover, Air Europa is growing again in 2013 after some years of capacity cuts. This is part one of a two part report in which we assess its network and market position. Although financial data is scarce, we will analyse its revenue development and estimate its unit costs in part two. Meridiana: how to escape the impact of loss-making Italian airlines? Between 2007 and 2012, the total number of passengers carried by Air Europa fell by 18%, from 9.9 million to 8.1 million. LCC seats almost trebled in the domestic Spanish market and grew by 25% in international markets from Spain over the same period (source: CAPA analysis of data provided by OAG). 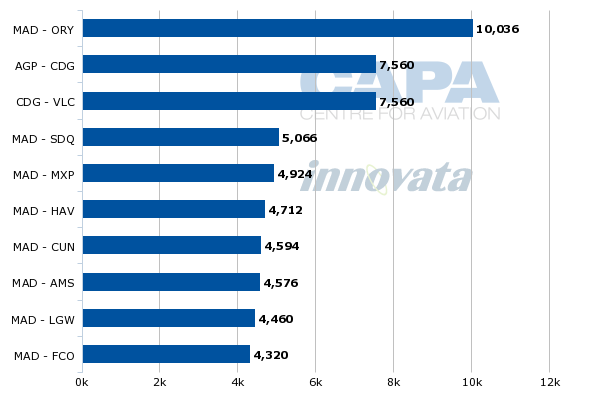 According to OAG data, Air Europa’s scheduled seat capacity fell by 23% between 2007 and 2012, with a cut of more than 40% in domestic capacity only partially offset by growth in international capacity from 2010. Its share of total seat capacity in Spain fell from more than 6% to less than 5% over this period, with its share of domestic capacity falling from almost 14% to just over 10%. Away from the domestic market, the story is more positive: Air Europa’s international seat numbers in 2012 were almost one third higher than in 2009 and its share of international capacity to/from Spain grew to 3.1% from 2.6% over the same period. This international growth focused on both Western Europe and Latin America. In both of these regions, Air Europa increased seat capacity by more than 40% between 2009 and 2012. In 2013, Air Europa’s capacity is growing again, in both the domestic and international markets. Data from AENA show that Air Europa carried almost 6% more passengers in 1H2013 versus 1H2012, with growth of more than 12% year-on-year in Jun-2013. Ongoing capacity cuts by Iberia, the demise of Spanair in 2012 and cuts by both easyJet and Ryanair in their Spanish capacity appear to have presented Air Europa with an opportunity to recover some lost market share. In Jun-2013, Ryanair’s year-on-year fall in passenger numbers in Spain was 10% and easyJet's 15% (source: AENA). 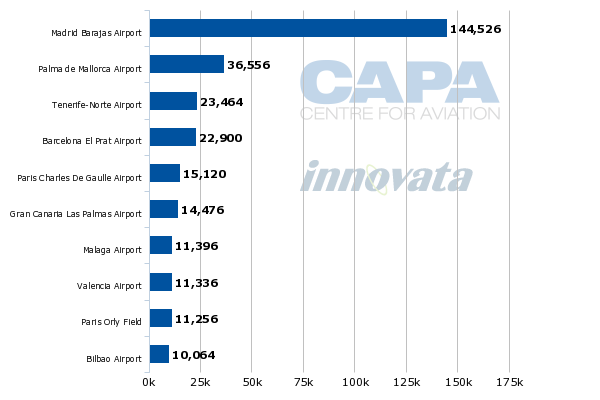 CAPA analysis of OAG data suggests that Air Europa’s total seat capacity in 2013 is 3.6% above 2012, giving it its first year of growth since 2007. Growth is highest in the domestic market, where it is increasing seat capacity by 5.4%, reversing the declining trend of recent years. Much of Air Europa’s growth in domestic capacity in 2013 is the result of new routes linking mainland cities. 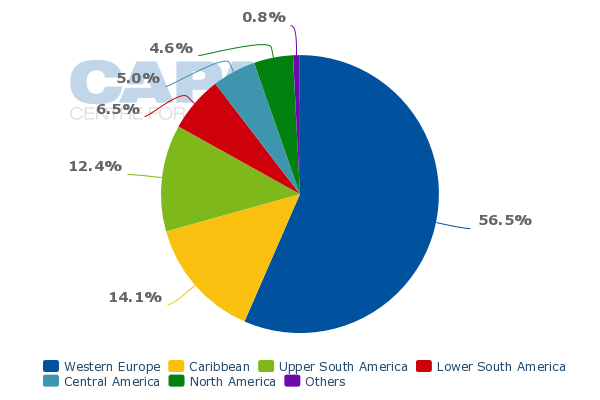 Its international seat growth is just 1.5%, although it is growing in Latin America at 3.4% in 2013. 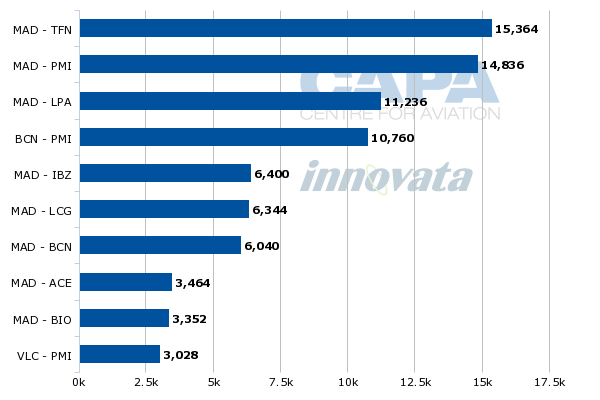 According to Innovata data for the week of 22-Jul-2013, Air Europa is the fifth largest airline group in Spain by number of seats, with a share of 5%. Three of the four groups ahead of it are foreign (if we count IAG as Spanish), illustrating the extent to which the Spanish market has been taken over by carriers from other countries. It is the leading carrier from Spain to the Caribbean and number three on Spain to Upper South America and Spain to lower South America. 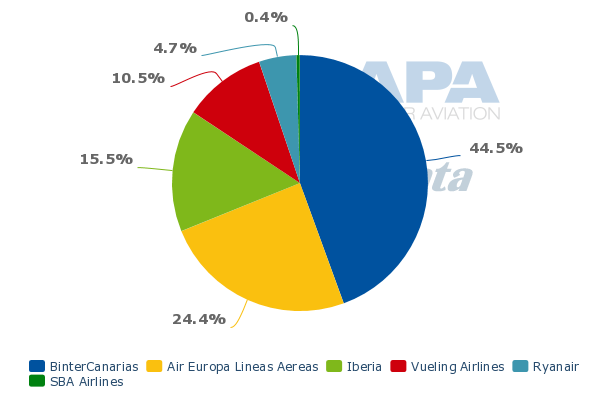 Air Europa is the number two airline group overall on Spain to Latin America, behind IAG (and Spain is the leading country market from Europe to Latin America). 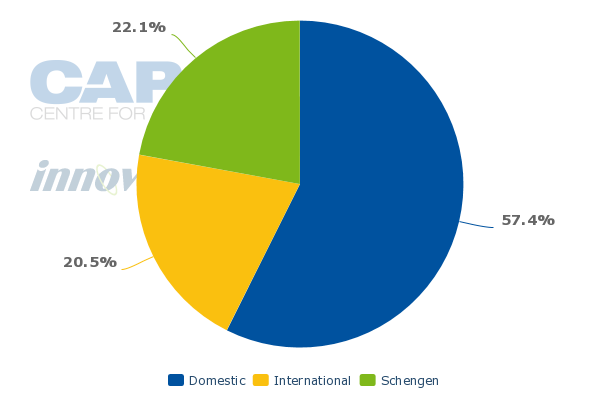 More than half of Air Europa’s seats (57%) are in the domestic market (source: Innovata, week of 22-Jul-2013). Of its international seat capacity, almost 57% is in Western Europe and 38% is in Latin America (including the Caribbean). Less than 5% of its international capacity is in North America after a cut of more than 50% in its seat capacity to the region in 2012 and a further cut of 18% this year (source: OAG). Its Caribbean, Central American and North American capacity is fairly seasonal, reducing significantly in the northern winter. 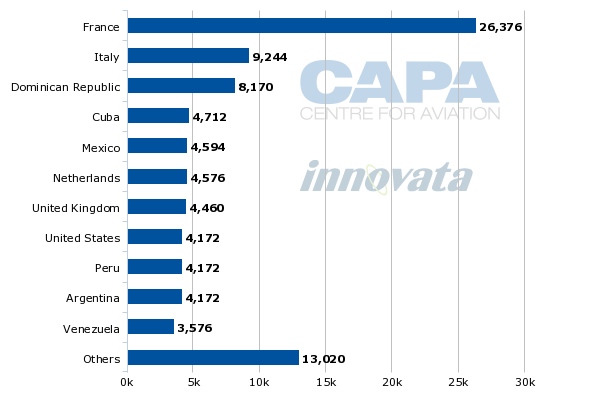 France is Air Europa’s most important international destination country, accounting for 29% of its international seats (week of 22-Jul-2013, source: Innovata). As a SkyTeam member, its codeshare agreement with Air France helps to explain this. Italy and the Netherlands are also important European destination countries, reflecting its codeshares with Alitalia and KLM. Latin America is represented by the Dominican Republic, Cuba and Mexico among its leading country destinations. Although its headquarters are in Palma de Mallorca, Air Europa’s biggest hub by seat capacity is Madrid Barajas Airport, with Palma number two, Tenerife-Norte number three and Barcelona number four. It is the number two ranked carrier by seats at Madrid, with a share of 15%, some distance behind Iberia’s 43%. 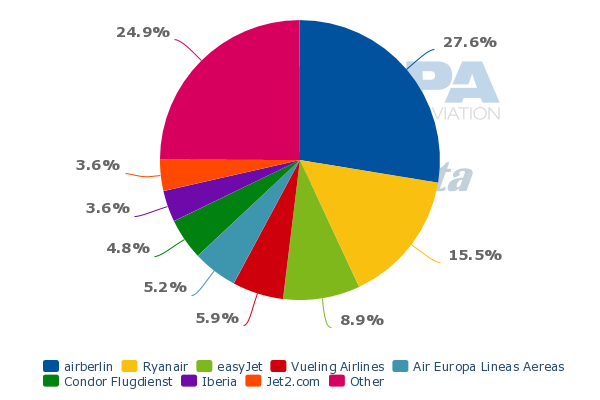 The IAG Group, including Vueling and British Airways, has a total share of 49%. 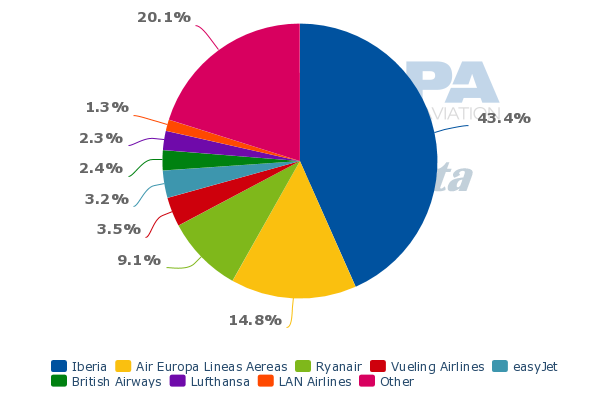 In spite of their capacity cuts, Ryanair and easyJet still have more than 12% of Madrid seats between them. Air Europa only ranks fifth by number of seats at its Palma de Mallorca home, where airberlin is number one and LCCs have a high share. 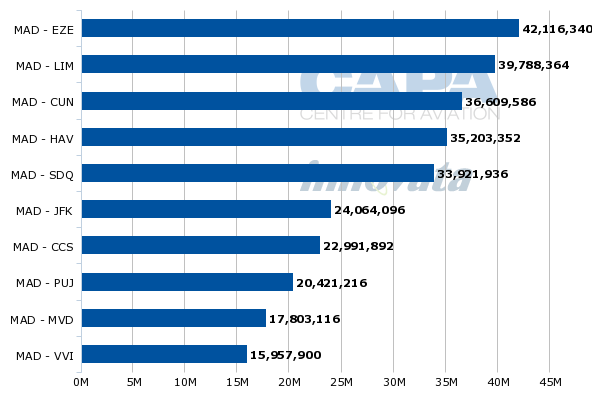 At Tenerife Norte, Air Europa is number two behind Binter Canarias and at Barcelona it ranks only in seventh place. Turning to its other main Spanish bases, at Gran Canaria it is fourth with 9% of seats (behind Binter Canarias, Ryanair and Iberia); at Malaga, where almost every major European LCC operates, it is outside the top eight; at Valencia it is fourth (behind Ryanair, Iberia and Vueling); and at Bilbao it is fourth (behind Vueling, Iberia and Lufthansa). Overall, it lacks an airport base where it has a strong market position. Air Europa’s domestic route map is evolving as it adds new routes between mainland cities, such as Madrid-A Coruña (Jun-2013), Madrid-Badajoz (Jul-2013), Barcelona-Badajoz (Jul-2013), Madrid-Asturias (Nov-2013). Nevertheless, at least in Jul-2013, seven of its top 10 domestic routes by seats link Spanish island cities with the mainland. To some extent, this differentiates it from Iberia, for whom only three of its top 10 domestic routes are to/from Spanish islands. However, this does not appear to have given Air Europa a defendable niche. It is number one on only three of these routes and it faces competition on every one of the 10 domestic routes. There is more than one competitor on eight of the routes; Iberia competes on eight and Ryanair on six. Eight of the 10 involve Air Europa’s Madrid hub. Turning to its top 10 international routes by seats, six of these involve SkyTeam European partner airports in Paris, Milan, Amsterdam and Rome. This allows it to offer a more substantial network through codeshare agreements with Air France, Alitalia and KLM. Two of the routes involve Spanish cities other than Madrid (Malaga and Valencia to Paris). There are three long-haul destinations in this list, including Cancún, which is part of the network of SkyTeam codeshare partner Aeromexico. Although it faces competition on nine of these 10 routes, and more than one competitor on six of them, it is number one on five of them and this list includes one monopoly route: Madrid to Santo Domingo, the capital of the Dominican Republic. However, there are at least two LCC competitors on all seven of the short-haul city pairs in the list. 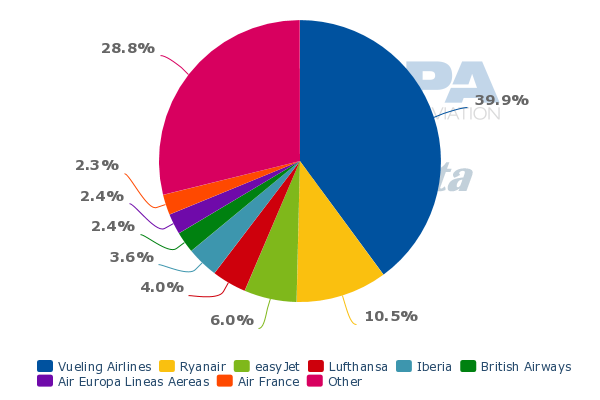 Looking at Air Europa’s top 10 international routes by ASK reveals its most important long-haul destinations. Of the 10, which are all to/from Madrid, nine are to Latin America and one is to North America, New York. Air Europa is number one on five routes, including two monopolies, and number two on the remaining five. Six are duopolies. On one of the duopolies, Madrid to Santa Cruz, Air Europa has reportedly proposed a strategic alliance with competitor Boliviana de Aviacion (Terra/DPA, 12-Jun-2013). Overall, our analysis of Air Europa’s market position suggests that it can rarely escape competition, but it is less fierce on long-haul routes than on short/medium-haul and slightly less fierce on international short/medium-haul than on domestic routes. Its market niche to Latin America is a strategic asset, especially on routes to the Caribbean, where Iberia is a relatively small player. In addition, its links to SkyTeam partner hubs elsewhere in Europe help to feed this asset. Any return to strong growth in Spain by the major non-Spanish LCCs Ryanair and easyJet could threaten Air Europa’s re-emerging short/medium-haul network and erode some of its long-haul feed. In part two of our report on Air Europa, we will look at how its market position translates into revenue trends and consider whether its cost structure can be competitive versus LCCs and other competitors.